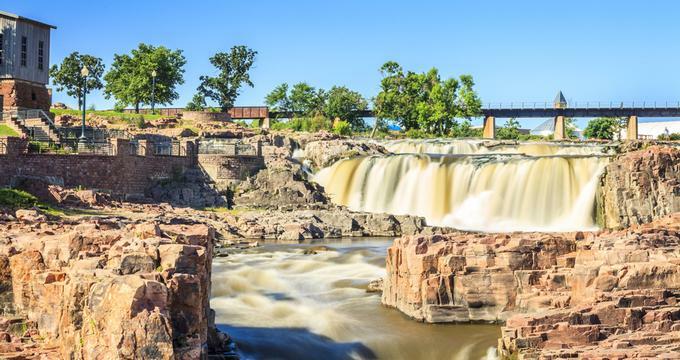 The largest city in South Dakota, Sioux Falls was founded in 1856 and is located next to the spectacular falls on the Big Sioux River. Plan a weekend trip to get to know the city’s magnificent nature, historic buildings, unique museums, art and restaurants. Top things to do in Sioux Falls for families with kids include the Great Plains Zoo, the Outdoor Campus and the Sertoma Butterfly House & Marine Cove. Falls Park is 123-acre park around the falls on the Big Sioux River for which the city has been named. The falls and the spectacular nature around them have been the center of life in the area for centuries. The remains of the 1881 seven-story Queen Bee Mill can be seen on the east side of the river, and the 1908 Sioux Falls Light and Power Company building is now the popular Falls Overlook Café. The 19 mile hiking, biking, and walking trail starts at Falls Park and makes a loop around the city. Located on South Oxbow Avenue, the Sertoma Butterfly House & Marine Cove is an attraction that features several educational exhibits. The 3,600 square foot Butterfly House is kept at a warm 80 degrees for the 800 butterflies and the beautiful tropical garden, allowing visitors to see and admire both attractions. The butterflies come from Africa, Asia, Australia, and Central and South America. The Sertoma Butterfly House & Marine Cove is one of the best things to do in Sioux Falls, SD. Located on West Sixth Street, the Old Courthouse Museum is a historic building that served as the first Minnehaha County courthouse. Built between 1889 and 1893 by local architect Wallace L. Dow, the building is made of native Sioux quartzite stone, a popular local building material in the late 19th century. There are many interesting and aesthetically pleasing features inside the old courthouse, including stained glass windows, tiled fireplaces, granite pillars, and slate stairs. The 16 large murals on the walls of the hallways portray early life and local nature. The courthouse remained in use until 1962 when it was slated for demolition after a new courthouse was built. However, citizens campaigned to save the historic building, which can now be toured. The Washington Pavilion of Arts and Science is an arts and science center located on South Main Avenue. Opened in 1999, the center consists of an art gallery, a concert hall, a science museum, and a large-format theater. It is housed in the renovated Washington High School, a neoclassical building whose facade is made of Sioux quartzite. The center is home to several educational institutions such as the Community Learning Center, the Dakota Academy of Performing Arts, and the Graham Academy Preschool. Several organizations are associated with the center including the South Dakota Symphony Orchestra, the Sioux Falls Jazz & Blues Society, and several others. Located on South Kiwanis Avenue, the Great Plains Zoo and Delbridge Museum of Natural History is a 45-acre zoo and museum. Opened in 1963, the zoo has more than 1,000 animals like giraffes, primates, and tigers, among others. The museum displays exhibits such as Asian Cats, Birds, Bugs, and Amphibians, Flamingo Aviary, and Rare Rhinos of Africa. The Outdoor Campus is an outdoor learning center located on South Oxbow Avenue. Operated by the South Dakota Game, Fish, and Parks, it teaches outdoor activities and skills such as cross-country skiing, fishing, gardening, and much more. The campus offers a wide variety of programs for both adults and children. Adults can participate in community programs as an individual or as part of a group like a church group. For children, there are programs for homeschoolers, preschool and elementary students, and middle school students as well. The campus also sponsors events such as the Outdoor University where family members have the opportunity to enjoy many free activities like fishing, kayaking, and touching fish, frogs, and turtles. Terrace Park is a public park located on West Fourth Street operated by the Sioux Falls Parks and Recreation Department. The park contains many amenities and facilities and has several sports facilities such as baseball fields including miracle league ball fields, basketball courts, tennis courts, walking trails, and more. There are access points for canoeing, fishing, and kayaking. Several sculptures, formal gardens, and Japanese gardens enhance the beauty of this park. Families and groups can take advantage of playgrounds and picnic shelters with electricity. The Terrace Park Family Aquatic Center includes a large swimming pool, drop-off slides, a looping water slide, and a wading area. Road trip ideas with kids: Blue Bell Lodge in Custer, South Dakota. Located on West 12th Street, the USS South Dakota Battleship Memorial is a display that includes several relics from the historic battleship. The outline of the hull of the ship is made of concrete, and visitors can view both the relics and several pieces of memorabilia. The ship was constructed beginning in 1939 and was launched and commissioned in 1942. The USS South Dakota was the lead ship of its class and saw heavy action during World War II in the Pacific Ocean; two of the battles included the Battle of the Santa Cruz Islands and the Second Naval Battle of Guadalcanal. Sold as scrap metal after being decommissioned, parts of the ship were saved for this memorial. The Cathedral of Saint Joseph is a Catholic cathedral and the seat of the Diocese of Sioux Falls. Famous architect Emmanuel Louis Masqueray designed the beautiful limestone, but he died before the cathedral was finished. Construction of the cathedral was completed in 1919, and the building underwent many later additions. A Kilgen pipe organ was installed in 1935 and the tester and marble high altar in 1946. Beautiful French stained glass windows were installed in 1947. The cathedral has occasional organ concerts that are open to the public, as well as series of conferences on topics relevant to wider audiences, including non-Catholics. Veterans’ Memorial Park, a public park located on West Bailey Street in Sioux Falls, commemorates the military history of the people of the local area. After veterans' organizations and the community began developing the idea of a memorial, a committee was formed to discuss the project with the public and with designers. Eventually, a site was chosen north of Terrace Park. It was an area the U.S. Army Air Corps used during World War II. Dedicated in 2006, the park’s amenities include military memorial and historic displays, sculptures, walking trails, and gardens. The entrance to the park consists of an amphitheater, flags, plazas, and walls. More ideas: 22 Best Things to Do in Arlington, VA. Located on North Duluth Avenue, the Pettigrew Home & Museum is a historic house museum. Originally built in 1889 for Thomas and Jenny McMartin, Senator Richard Franklin Pettigrew eventually bought the house in 1911. Pettigrew enjoyed traveling and collecting objects, and he eventually added a museum to the back of his house to store the many items in his collection. These include things such as Native American clothing, natural history specimens, stone tools, and items related to local history. Pettigrew bequeathed the house to the city, and today visitors can see the many artifacts in the museum as well as the house, which has been restored to look as it did in the early 20th century. Falls Overlook Cafe has a million dollar view. Located on the steep bank of the Big Sioux River in Falls Park, Sioux Falls, this quaint restaurant overlooks a series of wild tumbling falls surrounded by lush greenery. It is set in a restored 1908 quartzite building that was a hydroelectric power plant for the Sioux Falls Light and Power Company until 1974 when it was abandoned. The Cafe is a popular place for visitors of the Falls Park to take a break, enjoy the view and grab a bite to eat. The cafe has a small menu of excellent freshly made soups, salads and sandwiches and has tables both inside and outside. Cafe guests also have a chance to see a number of historic exhibits displayed in the building. Opened in 1941, the stadium holds 4,500 people and underwent several renovations in 2000. 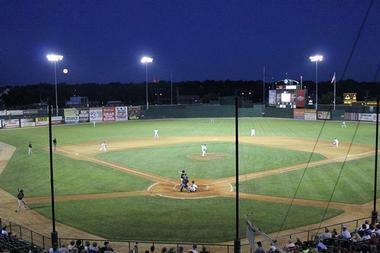 The stadium offers several children’s programs such as Mini Manager of the Night and Play Ball Announcer. Every year, downtown Sioux Falls turns into an art museum without walls. Sculptors from all over the world are invited to place their sculptures in designated spaces along the city streets, where they stay for a year. City residents, tourists, and all passers-by are encouraged to vote for their favorites. 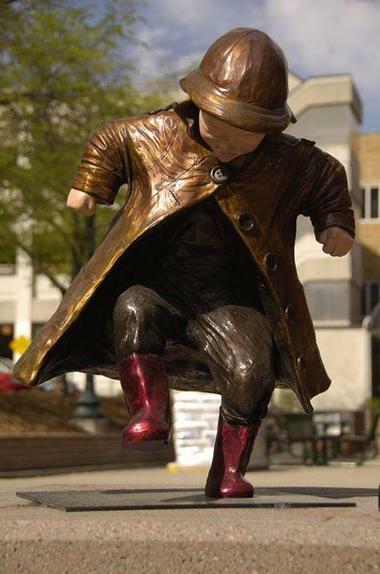 There are about 14 awards that total $15,000, and each artist can bring up to four sculptures. All artistic styles are accepted, from modern, traditional, and abstract to representational. The sizes also vary greatly. The open sculpture exhibition started in 2003 and is gaining immense popularity. It is a great tourist attraction, which was the original goal, but it is also bringing city residents out on the streets where they can really appreciate not only the art but their beautiful city as well. All sculptures are available for sale. Check their web site for event dates. RedRossa Napoli Pizza is a cheerful pizza place where you can get authentic Neapolitan style pizza made using the same process they have been using in Naples since the first century A.D. Italians are very serious about their pizzas, and you can be sure that RedRossa pizzas are authentic by checking their certification, which is not easily obtained and requires rigorous dedication. RedRossa pizzas are thin-crusted, hand-stretched, and delicious. Preparation starts with nothing but fresh tomato sauce and virgin olive oil. The rest is up to you. While you can find an extensive list of their signature pizzas, you can also design your own – add as many cheeses, meats, and veggies as you wish from the list. They will assemble it in front of you and bake it in their wood fired oven. RedRossa also has some great pastas and salads, but you will not be able to resist the smell of hot pizza straight from the oven. Wild Water West is closed and will reopen at the end of May, 2016. Wild Water West is a water park located on 466th Avenue in Sioux Falls. 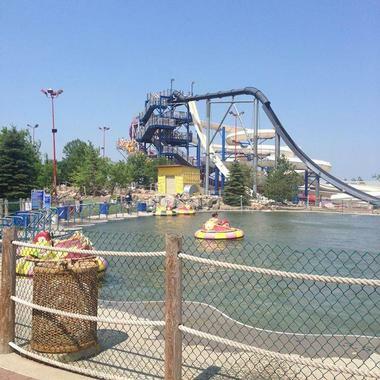 Established more than 25 years ago, Wild Water West is the largest water park in South Dakota. Some of the water features of the park include Tornado Alley, a 55 foot long tube slide; the 65 foot high Waterslide Complex with four slides; and the Wave Pool with up to six foot high waves. There is a Swim-up Bar for adults who are interested in enjoying a few alcoholic beverages and an activity pool and baby pool for children. Amenities for non-water activities include batting cages and go karts, and visitors can also partake in mini golf, paintball, and sand volleyball. 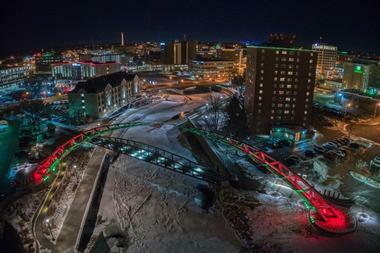 More vacation ideas: 19 Best Things to Do in Fargo, North Dakota. The only Brazilian restaurant and steakhouse in South Dakota, Carnaval is a popular and spacious place with compelling décor and soft lighting. Lots of green plants, bright art pieces, and the neon blue ceiling create the festive atmosphere of a real Brazilian carnival. If you are looking for romantic date ideas, Carnaval is a great place to try. The restaurant is famous for its salad bar with over 55 choices and the all-you-can-eat “Gaucho Meal” – slow-roasted meats (Churrasco) served at the table. 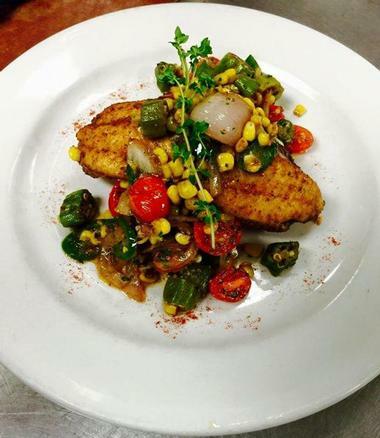 An à la carte menu includes great burgers, seafood, pizzas, and sandwiches. The restaurant has a nice patio and regular live music on weekends, and Carnaval is equally suitable for large groups as it is for intimate romantic dinner. Once a month, Carnaval has food and wine pairing evenings by reservation only. 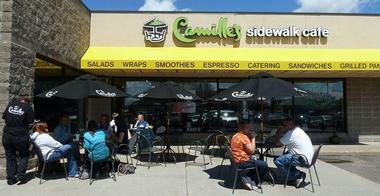 Located in Gilrich Village Mall, Camille's Sidewalk Café is a health food restaurant with a pleasant bright space indoors and a spacious outdoor patio available for use when the weather permits. 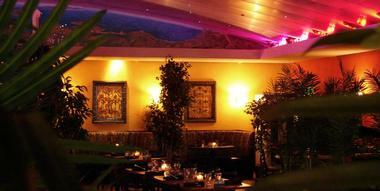 They serve fresh salads, flavorful gourmet wraps, sandwiches, and flatbread pizzas. Their fruit smoothies are made from fresh fruit and are available with yoghurt. Camille’s serves breakfast tortilla wraps the whole day, and they have a wide range of spiced tortillas like herb-garlic and jalapeno-cheddar. These tortillas make for excellent grilled hot wraps such as the Michelangelo with grilled chicken breast, roasted red peppers, red onions, black olives, mozzarella, rosemary, thyme, and balsamic glaze. The restaurant also provides a nutrition information sheet for all their dishes, and they have many gluten free options. Crawford’s is an upscale bar and grill located in an 1896 former butcher’s store that has been meticulously renovated and restored; it features original quartzite and brick walls and dark overhead beams. The décor is funky and theatrical, from hand painted, jeweled wallpaper and Moroccan chandeliers to the cowhide-paneled bar and reclaimed wooden tables. This spectacular ambiance is a perfect background for enjoying outstanding food, including excellent grilled meats and fish and some very interesting small plates such as spinach and artichoke gratin with smoked Gouda cheese and sun-dried tomatoes served with crostini. They have an extensive beer and wine list and some original and innovative cocktails. 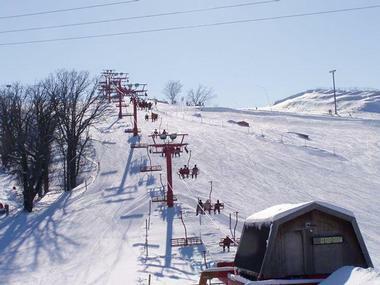 Great Bear Recreation Park is a ski area owned by the city of Sioux Falls. Often referred to as just Great Bear, it is situated in the northeastern section of the city. Established in 1963, the ski area opened with just two runs and one rope tow. Later, a lodge was built and more runs and tows were added. Today, the park has twelve runs and three lifts: a handle tow, a magic carpet, and a quad chairlift. At Terrain Park, skiers can perform tricks like aerial maneuvers. The park is an all-season park, and during the warm months visitors enjoy spectacular views on the eight miles of walking trails. 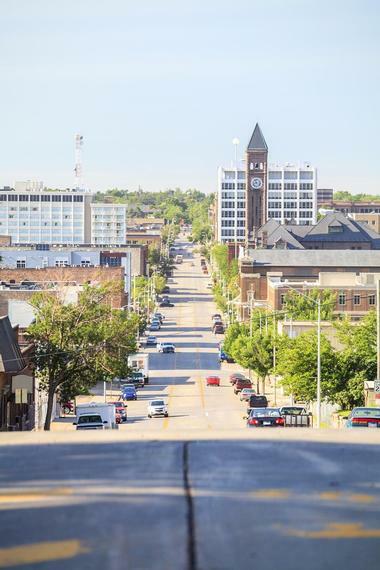 More trip ideas: Brookings, South Dakota. Sioux Falls Bike Trails is an extensive system of bicycle trails that run through the parks and green spaces of Sioux Falls. There are more than 70 public parks in the city. Falls Park is centrally located and serves as the hub of the park system; many of the other public parks are connected to Falls Park by the bicycle trails. The trail system is bordered on the north by Interstate 90, on the west by Westward Ho Park, on the south by 57th Street, and on the east by Rotary Park. There are over 20 miles of paved multi-use paths, and bikers share the paths with walkers and runners.